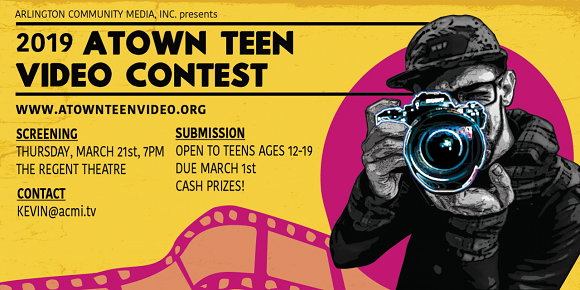 A Town Teen Video Contest is Arlington area’s only homegrown festival for teen videographers. Last year’s contestants came from Arlington, Lexington, Cambridge, Somerville, and Lowell, and we expect even broader participation this year. Cash prizes up to $500 will be awarded in a number of categories, and in addition to being shown on the Regent’s big screen, the films will be showcased on ACMi’s channels for weeks thereafter.